It’s hard to be a progressive in Pennsylvania. We think of ourselves as a modern, Northeastern state on a par with Massachusetts and New York, Connecticut and New Jersey. But when it comes to state politics, we find ourselves looking with envy at those states with their progressive taxes and higher (and much more equal) spending on education and human services than here at home. And it’s gotten worse in recent years as right-wing extremists have taken hold of one of our political parties. This year is no different. I’ve already complained about an appropriations bill that does not invest enough in education and human services and the environment and a tax bill that relies too much on one-shot rather than recurring revenue and makes some dubious assumptions about how much the state will raise from liquor and gaming licenses. There were, however, some victories, big and small, this year to which I want to point out. And it’s important to recognize them because what brought us those victories this year will, if we ramp up our efforts, bring us bigger ones in future years. The big victory this year is what didn’t happen—we didn’t have to make drastic cuts to close the structural deficit, which started the year at $1.8 billion. Governor Wolf made raising the revenue to close that deficit central to his political task this year. And, while closing a deficit may not be the most attractive political goal, we at PBPC and the Pennsylvania’s Choice campaign followed his lead simply because he was right. We and the Governor feared that without new revenue, devastating cuts in education and human services would be necessary. Recovery in our economy and the new tax revenue it created reduced the deficit to about $1.3 billion. And while we closed about half of it with one-time revenues and borrowing from other funds, the General Assembly did raise recurring revenue through a variety of taxes PBPC has championed over the year to close the other half—and to fund new investment in K-12 and higher education. Avoiding a disaster isn’t a huge progressive achievement. But it is a real one. And at a time when extremists, especially in the House Republican caucus, seem determined to hold the government hostage to attain their goals, we should be glad to have secured it. So let’s take a moment to thank those who made that victory possible, starting with Governor Wolf, who set the course and held to it under a great deal of pressure. Legislative leaders in both houses negotiated long and hard to find a revenue package that could both close the deficit and secure a majority in both houses. 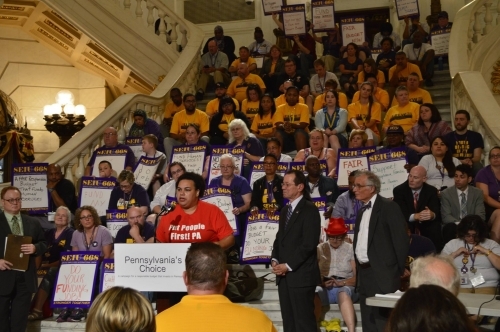 And human service providers, labor unions and activists in the Pennsylvania’s Choice Campaign and CLEAR Coalition kept insisting that cuts in education and human services were not an acceptable way to close the deficit. We asked the General Assembly, over and over, to #namethecuts. The Republican extremists couldn’t and wouldn’t do so. And that meant that they had to come up with the revenues. They didn’t come up with enough. We are still not investing enough on education, human services, and the environment. We’re going to have to keep fighting for more revenue and more investment next year. So let’s keep in mind what we didn’t win this year, but also take some inspiration from what we did win, too.